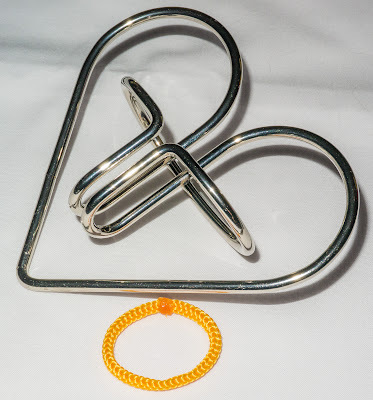 Now I was going to review one of the latest Hanayama cast puzzles, the Cast Delta, but Gabriel got to it before me at the end of last week so I have put that one on hold for a while and thought I would delve back into the wire puzzles again. 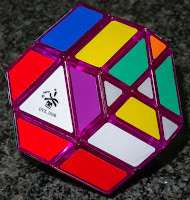 Today I am going to review the Panic Attack - one of Puzzle Master's own series of disentanglements. "When having a panic attack, a person has to try to figure out the clues as to why this is happening. You will also have to search for clues to solve the Panic Attack brain teaser"
Whilst you do need to think why it won't just pull off - this has nothing to do with panic! 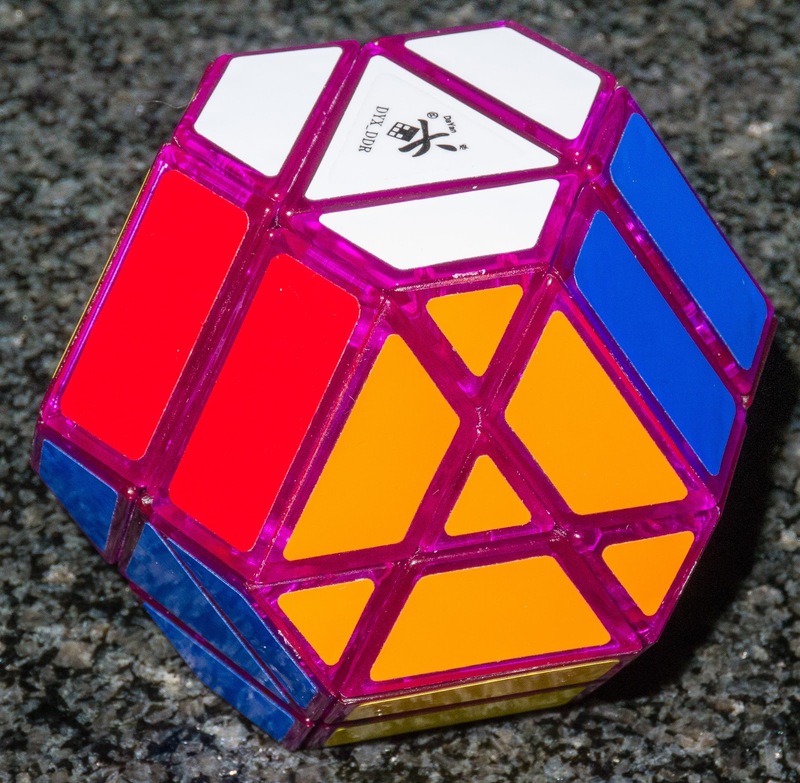 I actually prefer the original name (and description) for this puzzle given by it's designer, Kirill Grebnev, who also designed the gorgeous puzzle recently marketed by Hanayama, the Cast Harmony, which I reviewed here. It should not surprise anyone to find out that Kirill also was the original designer of the Eagle Puzzle which he called "Step in future". Kirill's original name for the Panic Attack was "Clear Heart", a much less macho name but definitely more evocative of the shape. It was designed in 2006 for submission to the IPP design competition and named because the aim was to remove something from the heart (sin? vice? string?) leaving one with a clear heart! Kirril's own rating is 3?s out of 5 which is the same as that given by the guys at Puzzle Master. At just $10 this is a nice easily affordable puzzle. Gabriel reviewed it here and agreed completely with the rating. It took him several attempts before he solved it and was only able to solve it after returning afresh. 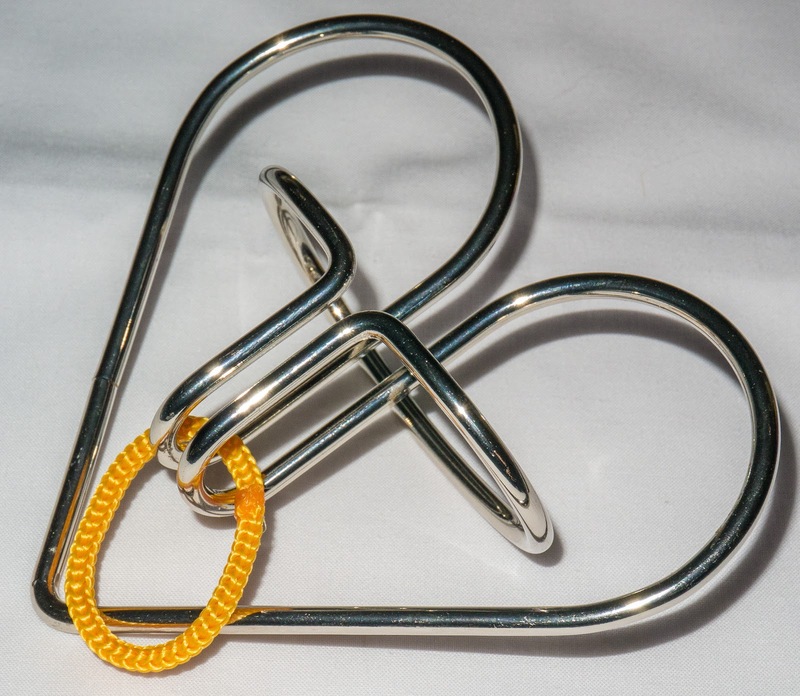 He described it as a "perfect puzzle even if you are not crazy about wire puzzles". Beware his page has a photo and description of the solution. No solution is provided with the puzzle but it can be downloaded directly from Puzzle Master here. So I had very high hopes for this one because of the designer and the similarity to the previous design as well as Gabriel's praise (I was careful not to look at his solution). I eagerly took it out and had a look. A very simple structure with no obvious exit point. I am sure that everyone does the same thing and tries to pull the loop around the bottom and over one of the internal "wings". No dice! The loop is not big enough for that and there is absolutely no stretch in it. In fact the loop is exactly the right size to do what is required and no more. From here a little fiddling reveals that there is actually very little movement possible at all. At this point the important thing is to think and if you have experience of others it will certainly help. I think that I solved it in about 4 or 5 minutes but only because I have done so many of this sort of puzzle now. I should imagine that most people would probably take 20 minutes or so and there is a truly lovely little Aha! moment that occurs as you try something improbable and it just unwinds off the wire. The solution is nothing like the Eagle but is a very clever idea anyhow. I agree with Gabriel that this is almost the perfect puzzle for people who are not hugely into wire puzzles. If you are an expert then it is quite fun but not tough at all. I am very happy to have it in my collection. Having solved it several times now over a period of a few days, it remains a little tricky, if you don't get the arrangement just right then it won't work. Why was this puzzle review not posted at my usual time and date? You can blame Kim Klobucher and Wil Strijbos and a few others for that! 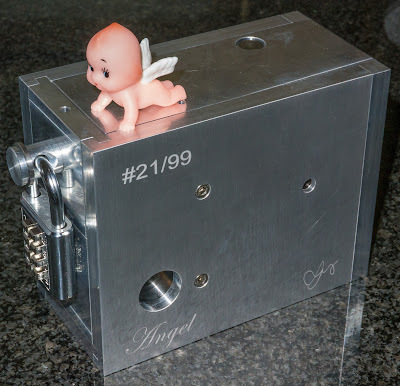 I received one of Kim's KCube MMMDXLVI N-ary boxes. 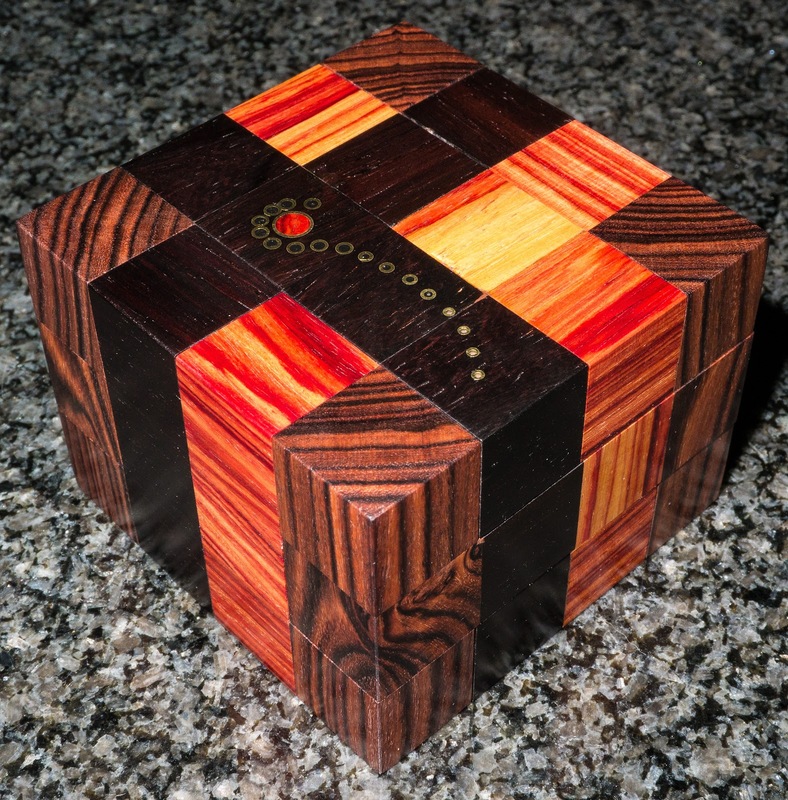 It is gorgeous, made from Kingwood, Tulip wood, Mun Ebony, and a brass inlay with Tulip wood and requires 3546 moves to open it. This, needless to say took me quite some time and kept me away from the blog!!! 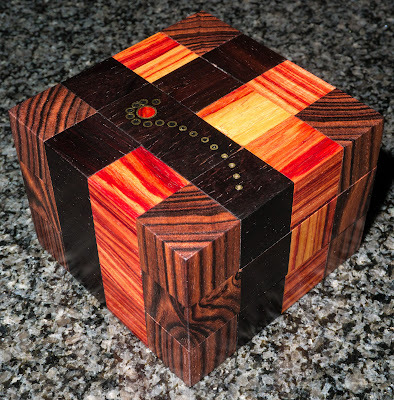 I don't collect boxes but I lurve my N-ary puzzles. Poor angel - entrapped in the box! 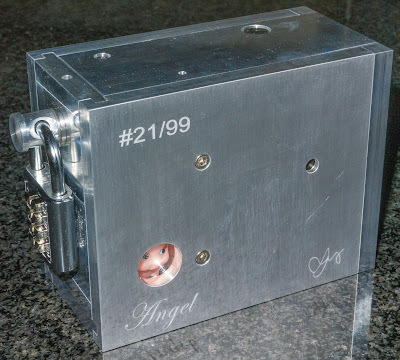 This is a sequential discovery puzzle in which the aim is to discover the tools required to free the angel from the box. No external tools are allowed and that INCLUDES not allowing the padlock to be used as a tool either! I had a good few days of fun with this! 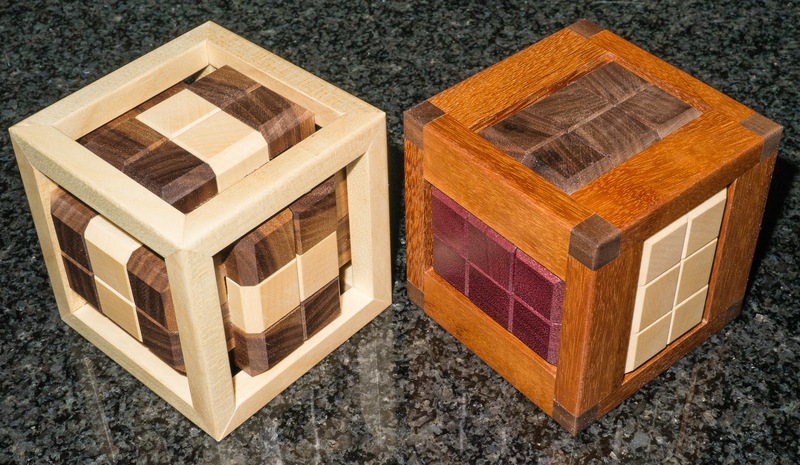 It is a seriously expensive puzzle but beautifully made and a wonderful voyage. I hope to write a proper review soon (although how much I can write without giving things away I don't know). If that wasn't enough to keep me occupied, I have been continuing to play with some high level burrs and getting absolutely nowhere! I have also been twisting the night away with the Dayan Gem V (I really loved the other Dayan Gems - reviewed them here). There are now 2 further editions to the group the V & VII with the VI hopefully coming soon but looking extremely complex. The Gem V is a very interesting twisty that requires very few algorithms and can almost be solved intuitively. As you can see, I HAVE been busy!!! I'll be very impressed if you could do it just from a photo!